In 1990, Myles chose Rosie from a litter on the street, and their connection instantly made an indelible impact on the writer's way of being. Over the course of sixteen years together, Myles was devoted to the pit bull and their linked quality of life. 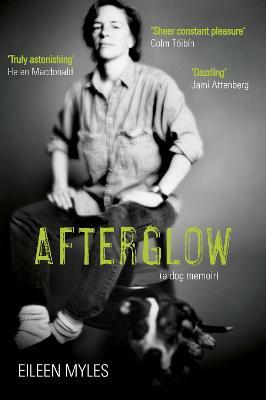 And starting from the emptiness following Rosie's death, Afterglow launches a playful and incisive investigation into the mostly mutually beneficial, sometimes reprehensible power dynamics between pet and pet-owner. At the same time, it reimagines Myles's experiences with alcoholism and recovery, intimacy and mourning, celebrity and politics, spirituality and family history, while joyously transcending the parameters of memoir. Moving from an imaginary talk show where Rosie is interviewed by Myles's childhood puppet, to a critical reenactment of the night Rosie mated with another pit bull; from shimmering poetic transcriptions of video footage taken during their walks, to Rosie's final enlightened narration from the afterlife, this totally singular text combines elements of science fiction, screenplay, monologue, and lucid memory to get to the heart of how and why we dedicate our existence to our dogs. Eileen Myles is the author of more than twenty books, including Chelsea Girls, Cool for You, and most recently, I Must Be Living Twice: New & Selected Poems 1975-2014. Their many honours include a Guggenheim Fellowship in nonfiction, four Lambda Literary Awards, the Clark Prize for Excellence in Art Writing, the Shelley Memorial Award from the Poetry Society of America, and their poems were featured in seasons two and three of the Emmy-winning show Transparent. They live in Marfa, Texas, and New York City.